It was a very emotional edition of Raw with Roman Reigns relinquishing the Universal title following the news that he is battling leukemia. The show also featured a contract signing between Ronda Rousey and Nikki Bella, Seth Rollins & Dean Ambrose going for the Raw tag titles, the new title match at Crown Jewel, an appearance by DX and more on the “go home” show for Evolution. Don’t forget to submit photos of your wrestling inspired Halloween costumes at www.facebook.com/POSTwrestling for your chance to win our final copy of “Creating the Mania” by Jon Robinson, courtesy of ECW Press. The winner will be announced next week. 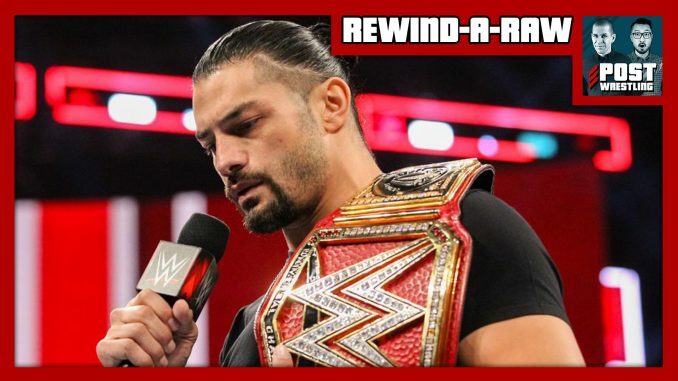 We also discuss TODAY’S TOP STORIES with the latest involving John Cena at Crown Jewel, the status of Alexa Bliss, a discussion on the Roman Reigns announcement, and all the latest news of the day. Plus Café feedback, comments & questions from the POST Wrestling Forum.